Happy almost October! The air is cooler, the sun sets sooner, and the season of pumpkin everything has begun. Before we get started, there’s something really special coming up, be sure you are signed up to receive the Polymer Notebook, my free email newsletter. There’s a lot going on in my studio. 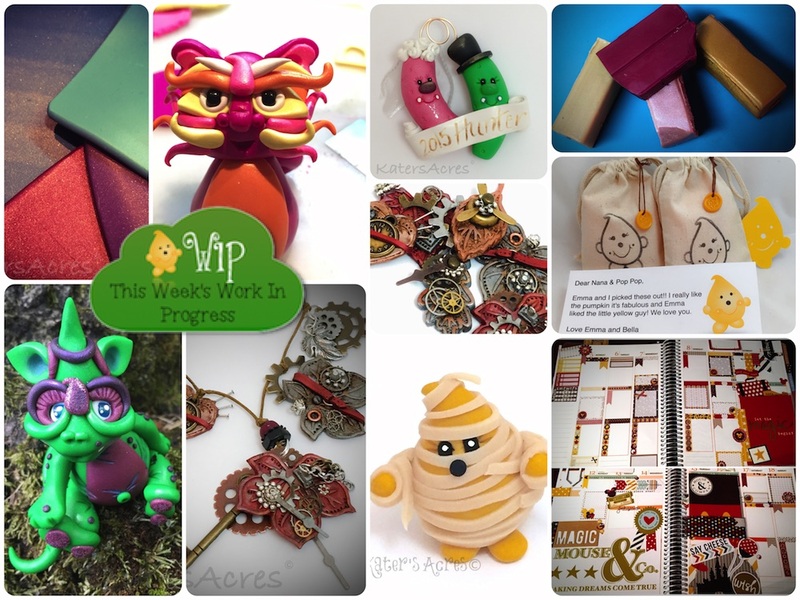 Don’t forget that you can follow me on instagram to see WIP photos as they happen too. This dragon will soon be released in my Etsy store. He’s a jointed Chinese inspired dragon, you can get the tutorial to make your own here. This bride & groom pickle ornament is a custom order for one of my seasonal shoppers. Every year for the past 5 years I have made her & her family pickle ornaments. This years ornament is a bride & groom pickle as her & her fiancé are tying the knot this month. Congrats to them! [Please note, I no longer take any custom orders as I simply do not have time]. These blocks of polymer clay began as just that, clay blocks. After love, lots of color manipulation, & some serious conditioning they turned into the cutest dragon that you ever did see. Learning to see beyond the block, combine colors, and enjoy the process is just one of the reasons I love polymer so much. These steampunk leaf pendants are some of my newest fall favorites. You can learn to make your own from this free video. Mummy Parker was released this week, just in time for Halloween. You can adopt him here. Last but not least,this little dragon’s name is Precious. She is such a sweetie. She was made as part of the #2015PCChallenge. Join the challenge any time by clicking here. What your packaging looks like says a lot about you and your brand. All our adoptions come with custom packaging. Parker ships in these little muslin bags, stamped with Parker on one side & Lolly on the reverse. Each bag also contains a little faux wax seal depending on what’s in the package; if Lolly is inside, it’s a Lolly seal and visa versa for Parker. Dragons ship in custom boxes as well. Including handwritten thank you notes, and small gifts with each order will help earn buyer confidence and return buyers. Remember, if it looks like your item was shipped in a hurry, buyers are less likely to return. Have you seen Meg Newberg’s newest Skinner Blend 4 Corner Blend Plug? If not, you need to check this out and see how positively simple & brilliant it is to achieve this effect. In addition, this month’s Cane Builder eZine (from Meg Newberg) is absolutely stunning. It’s just $5 a month for this great cane tutorial! Subscribe to Meg’s eZine here or read my review here. I have a really big announcement that I will be making soon. Be sure you are signed up for The Polymer Notebook (my FREE email for polymer clay enthusiasts) to find out more. If you haven’t joined The Pavelka Project yet, there’s still time and lots of fun prizes to be won too. Want more fall tutorials? Here’s 14 you might enjoy. 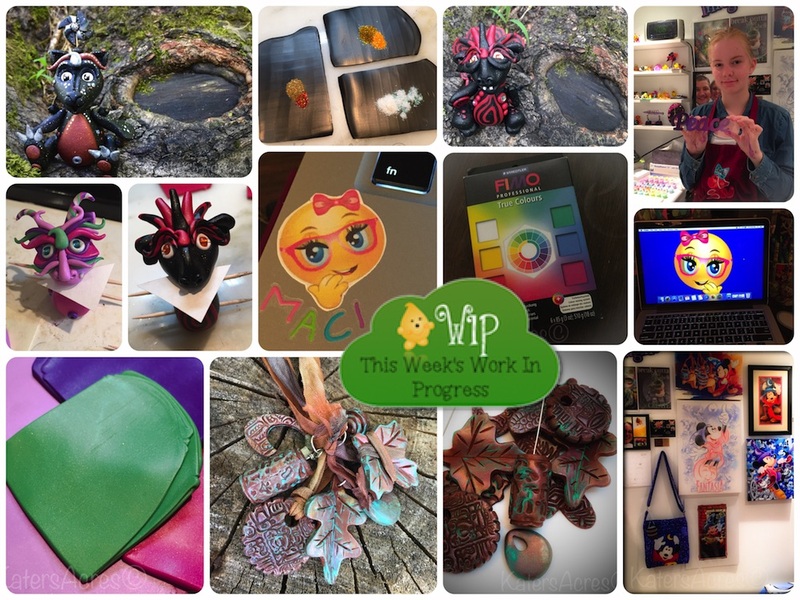 See behind the scenes in my polymer clay studio by following me on Instagram. My favorite season is here: fall! That means a lot of outside time, lots of pumpkin spice coffee, and a new seasons of surprises for a puppy who has never seen falling leaves before. This pumpkin spice coffee treat with marshmallows on top is a favorite fall studio work day treat. Just perk a cup of coffee, add half and half, add just a splash of pumpkin spice creamer, add marshmallows, and sprinkle with cinnamon. Ta-da! You’ll think you went to a real coffee shop, when you just made this fall favorite at home.